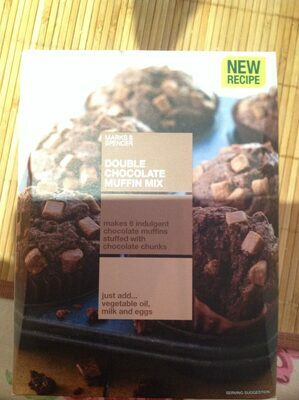 Muftin Mix (74%) - Milk Chocolate Chunks (26%) Muffin Mix contains Caster Sugar - Wheatflour · Vegetable Oils (Palm Oil · Rapeseed Oil · Palm Kemel Oil) · Cocoa Powder · Baking Powder (Raising Agent: E340, Calcium Phosphate) · Flavouring · Thickener: Guar Gum · Salt. Milk. 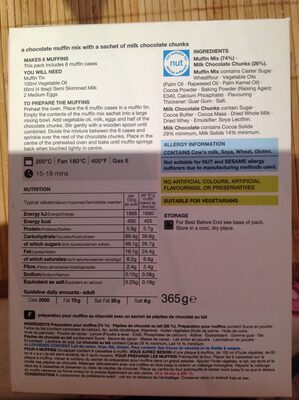 Chocolate Chunks contain Sugar · Cocoa Butter · Cocoa Mass · Dried Whole Milk · Dried Whey · Emulsifier : Soya Lecithin. Milk Chocolate contains Cocoa Solids 29% minimum, Milk Solids 14% minimum. Product added on October 3, 2013 at 12:03:31 PM CEST by openfoodfacts-contributors. Last edit of product page on April 15, 2019 at 6:29:47 PM CEST by teolemon. Product page also edited by beniben, kyzh, remilk.